I remembered seeing SCANDAL’s new guitars on Twitter at about the time when the lasses played the BILLBOARD Live 11th anniversary gig in Ōsaka, when someone jokingly said looks like they’ll be selling these guitars soon. And then the Fender Japan articles came out together with the online ads of them being available to buy at Japanese guitar stores. They weren’t cheap as this time these signature guitars were Fenders, although it was uncertain whether they were American or Japan made. Ikebe-gakki, a store in Tōkyō where I have bought gear from online finally had them and, err… I e-mailed them. The damage done? Well, I’ll just say the guitar was cheaper than the MSRP, as the Japanese good sales tax was waivered as this was an import, but all these were scuppered by the import duty, UK VAT and courier charges. Win some, lose some. She’s made in her motherland, of alder and finished in vintage cherry red poly. According to an interview in the Jan 2018 ish of Guitar Magazine (the Japanese one, not American), MAMIchan loved the finish of the Gibson ES-335. I don’t think I have seen this finish on a Strat before, and I’ve to say I agree with the missu… I mean, her. She has a good weight, lighter than my LTD MAMIcaster. 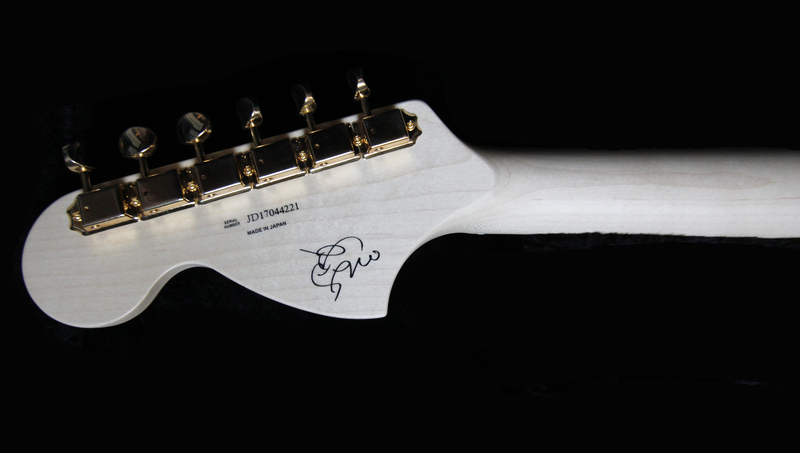 Her neck and fingerboard were maple, finished in satin poly. Not too fussed if it wasn’t gloss. I know it won’t age as well as nitro (prolly not age at all) but I think it will darken a tad, as my 18-year old Jazz bass has shown some ageing on her neck. The action was fine on taking her out of the box, as was her intonation. Interestingly, her strings were D’Addarios as opposed to Fender as described in the specs on the Fender Japan site. Playability was nice. I am pretty scared of playing Strats as I kinda prefer the “easier” shorter scale of a Gibson neck. Tone-wise, very versatile. 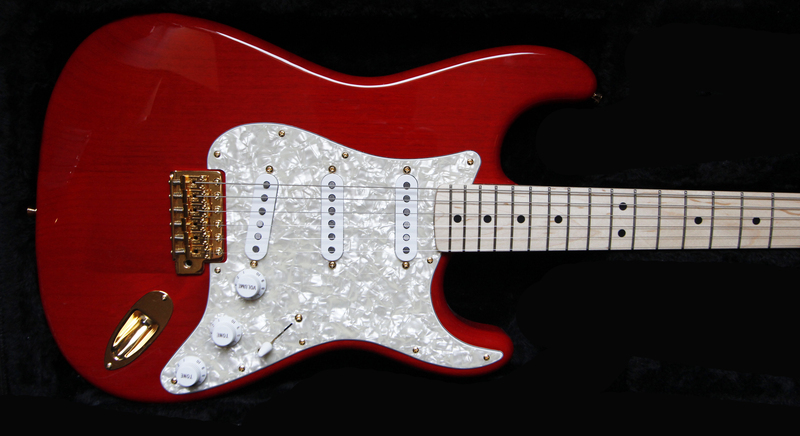 Equipped with the hotter Custom Shop Texas Specials™, I could still hear the Strat chukk! (sorry not good at transcribing what this is) even when the guitar is not too overdriven. The middle pickup is reverse wound hence, hum cancelling will be heard in positions 2 and 4. The bridge was vintage styled, and is gold, as are the rest of the hardware on her. I wasn’t too sure with the headstock on two counts. 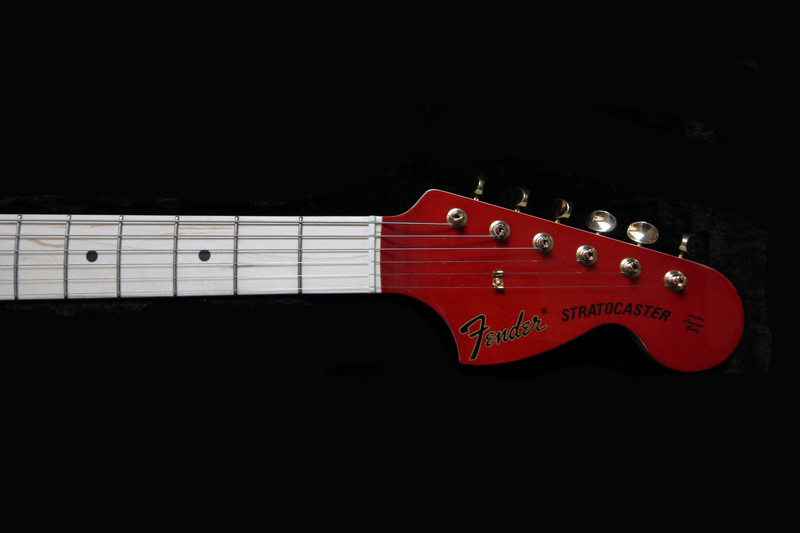 Wasn’t too happy with the 70s style, and to a lesser extent, that the headstock had the same red finish as the body. Nevertheless, these features finally grew on me. Interestingly, MAMI uses locking nuts on her own guitar, which looked like a Gotoh set from looking at the photos. The guitars that were produced commercially had Kluson-styled vintage non-locking heads. I did initially think of changing them to locking Gotohs but the positions of the screw will deface the neck. Besides, I don’t see myself going on gruelling tours liker the missus. Like the bridge, the Kluson heads are gold as well. On the back of head is also MAMI’s apple signature. I actually have more Strats than Gibsons. 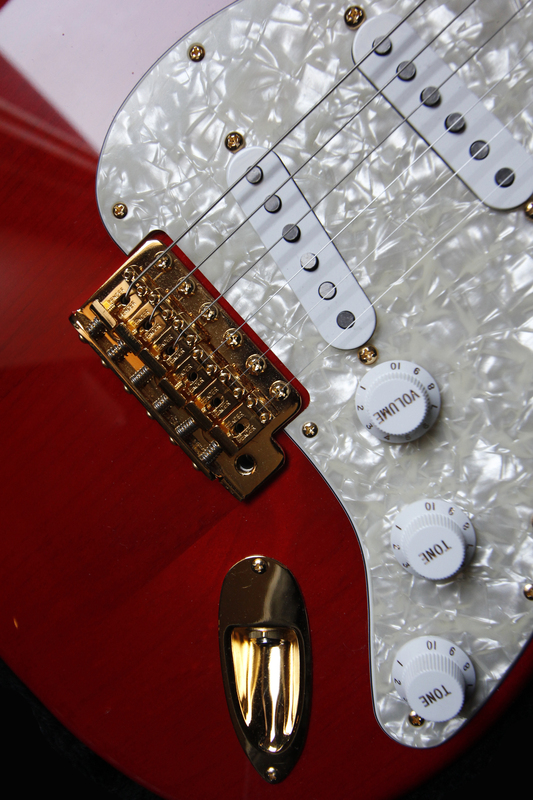 A selfish reason actually – I already have a 70s-styled Fender Strat. A gig bag, Fender Japan? Really?